After four extra hours of travel, several hiccups and a strong dose of suspense, Yogi Adityanath today addressed a crowd of thousands in Bengal's Purulia town. Uncertainty hung over the rally till the last minute, with the local administration officials claiming holes in the BJP's paperwork. But with the Uttar Pradesh Chief Minister -- seen as the biggest mascot of the BJP after Prime Minister Narendra Modi -- on way, the BJP was not ready to back down. 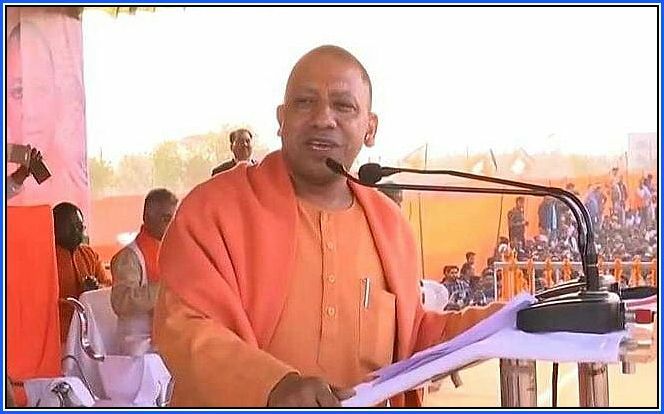 To pre-empt a debacle like Sunday -- when his chopper was not allowed to land for two rallies at Balurghat and Raiganj in north Bengal and he had to address the people on cellphone -- Yogi Adityanath took to the road on the last lap of his journey from Lucknow to Purulia. Landing at Bokaro in Jharkhand, he drove the 50-odd km to the venue. To his audience, Yogi Adityanath said he was not given permission to land in Purulia and it was time the "undemocratic government" was sent on its way out. The BJP - which is targeting at least 23 of Bengal's 42 Lok Sabha seats -- has complained to the Election Commission saying the Mamata Banerjee government was creating hurdles for party campaigns in the state. Last month, there was a controversy that went down to the wire over the permission for BJP chief Amit Shah's chopper to land in Malda. Earlier, the BJP's plan to hold three rath yatras across the state in December got scuttled, with the state's refusal of permission being upheld by the Supreme Court. Mamata Banerjee -- who was on a 40 hour sit-in protest in Kolkata that drew together the opposition - had sounded irate about the visit of her Uttar Pradesh counterpart. "Ask Yogi to take care of Uttar Pradesh first. So many people have been killed, even the police were murdered... so many people were lynched," she said. But Yogi Adityanath had also struck deep, citing the government order to delay Durga Puja immersion because of Eid. The issue had turned controversial with the BJP claiming this was yet another instance of Mamata Banerjee's minority appeasement. "The Bengalis are stopped from praying to goddess Durga... There are no restrictions on festivals in Uttar Pradesh... Vivekananda had told Hindus to proudly say that they're Hindus. Bengal gave Jana Gana Mana to the nation, it gave Vande Matram to the nation... Syamaprasad Mookerjee was a Bengali," he told his audience in Purulia. For two consecutive years, the government had stopped the immersion of giant idols of the goddess for a day because the idols are brought in huge processions to the Hooghly river. The administration did not want those to clash with 'tazia' processions of Moharram.